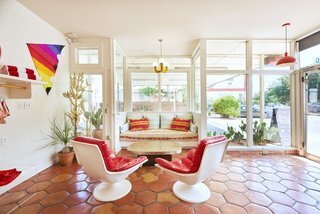 From the cheerful hues of the 1950s to the softer, earthier shades that were popular in the 1960s, your own take on midcentury-modern colors can add the perfect splash of nostalgia to your home. 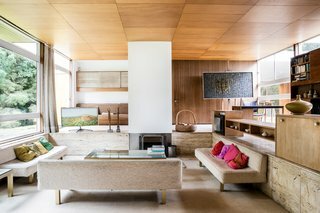 Whether you gravitate to fun citrus tones and multicolored concepts or more mellow neutrals, midcentury-modern colors can jazz up any room in your home—even if it wasn't built during the midcentury days. 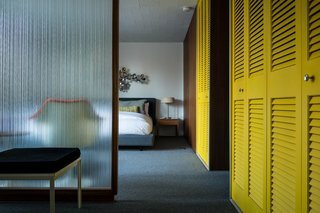 But remember, you can find inspiration from a midcentury color palette while also putting a fresh spin on it for today. Take a look at these recommendations and remember that they can be applied with paint, fabrics, surface materials, or even accessories. Deep yellows can open and warm up any space. PPG Pittsburgh Paints' Wright Mustard (FLLW321), and Glidden’s Wheat Stalk (30YY 52/515) are two paint colors that complement contemporary midcentury-inspired interiors. 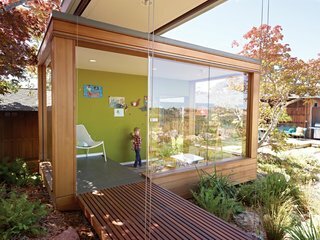 In this rare midcentury prefab, bright closet doors provide storage space and a healthy dose of color from various vantage points. Because this shade reflects light, it has a levity about it that works well with both muted neutrals and darker colors. Benjamin Moore’s Blue Seafoam (2056-60) is a good example of a relaxing blue paint color that works well for interior and exterior walls. 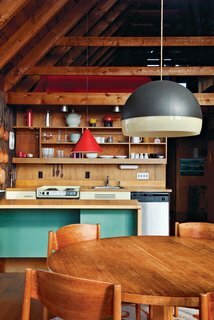 In the late-Jens Risom's family retreat in Rhode Island, a no-frills kitchen features wooden shelves that mimic the home's beams. The kitchen island is finished with an aqua-painted section. Deep, earthy greens like olive and wasabi were popular during the 1960s. This shade works well with burnt orange, gold, or dark brown and can add extra character to entrance foyers, lounge areas, accent walls, or even children’s playrooms. Restless Olive (SW 6425) from Sherwin Williams and Green Root (8334) from Jotun capture these shades well. Reds are great for designers and homeowners who want to be courageous with color. In fact, Frank Lloyd Wright even claimed his own favorite shade, calling it "Cherokee Red." He used it throughout his residential projects, often covering whole floors with it. This rejuvenated Austin hotel celebrates midcentury design with pops of red scattered throughout. These two orange colors were a popular choice for many midcentury architects and interior designers. Those who want to make a bold design statement with painted walls or doors will love midcentury tangerine shades such as Sherwin Williams’ Carnival (SW 6892) or Orange Fruit (2011-1) by Valspar. If you’re looking for a warm and fun, but more muted orange, try Wright Ochre (FLLW325) from PPG Pittsburgh Paints. This door, still with its Space Age knobs, is painted Flaming Torch by Behr. The brass wallhanging above the landing is by C. Jeré. To balance out bright reds, oranges, or yellows, try pewter grays, which can add a little cool to warmer color schemes. 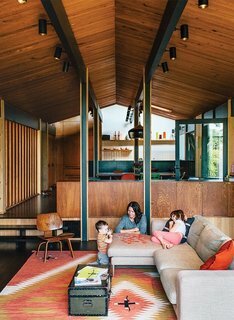 In this updated 1950s Portland home, a light gray Neo sofa by Bensen harmonizes with warm wooden walls, ceilings, and floors, as well as a red-and-mustard yellow vintage rug. If you’re thinking of gray for your walls or ceilings, Wright Soft Gray (FLLW872) from PPG Pittsburgh Paints is a versatile option. Different shades of brown can bring a masculine feel to living rooms and studies. Choose wood veneers, furniture, or woven textiles in earthy hues to give spaces a grounded feel. Try Behr's Cocoa Shell (HDC-AC-05) or Wright Oak Bark (FLLW623).